What a disgrace that New Zealand’s national bird (actually several species) is heading towards oblivion through predation (including by dogs, one of which killed 500 kiwi in just a few months before it was shot) and habitat shrinkage. The Flora Stream Conservation Project is a pest management project in Kahurangi National Park, started in 2001. The Friends of Flora and DOC are controlling stoats and possums to very low levels in an area eventually extending to more than 7000 Ha. 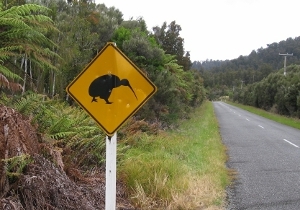 Many animals are expected to benefit including Great Spotted kiwi. This kiwi once used to roam freely in the hills around Flora Stream but they were wiped out 30 years ago by the usual suspects. The time is now right to reintroduce kiwi. Friends of Flora obtained some funding for the translocation and needed more for essential hardware such as transmitters which can broadcast information from kiwi nests. Fauna Recovery New Zealand contributed $8,400. 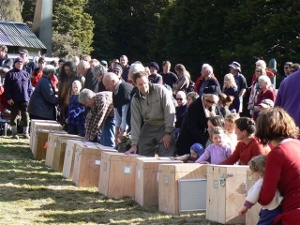 12 adult Great Spotted kiwi were reintroduced from a source population 30 km away in autumn 2010. We are awaiting news of breeding and could be for some time. Great Spotted kiwi seem to invest a lot more time into raising their young than other kiwi and any disturbance during this time can cause the parents to abandon their chick. For this reason the project team is shying away from intervention with any chicks while they are young.